My sister first introduced me to a glorious cake recipe quite a few years ago. I have recently finished perfecting it to for me and my kitchen. It took me so long because I refuse to make it too often because we will eat the entire cake if we do not have company or a party to bring the cake to. The first time I attempted this icing I totally fucked it up. It’s not foolproof like butter cream or a simple glaze. Take your time and make sure you have enough ingredients that you can throw it away once and try again just in case. I will be posting better photos as soon as I bake another cake. The cake is easy and delicious it comes out perfectly every time. It is the only chocolate cake I ever bake. I prefer to bake this in a bundt tin but I have cooked in 6, and 8 inch tins, and even as cupcakes. You will need to adjust baking times but I have never had this cake seriously flop in any pan. 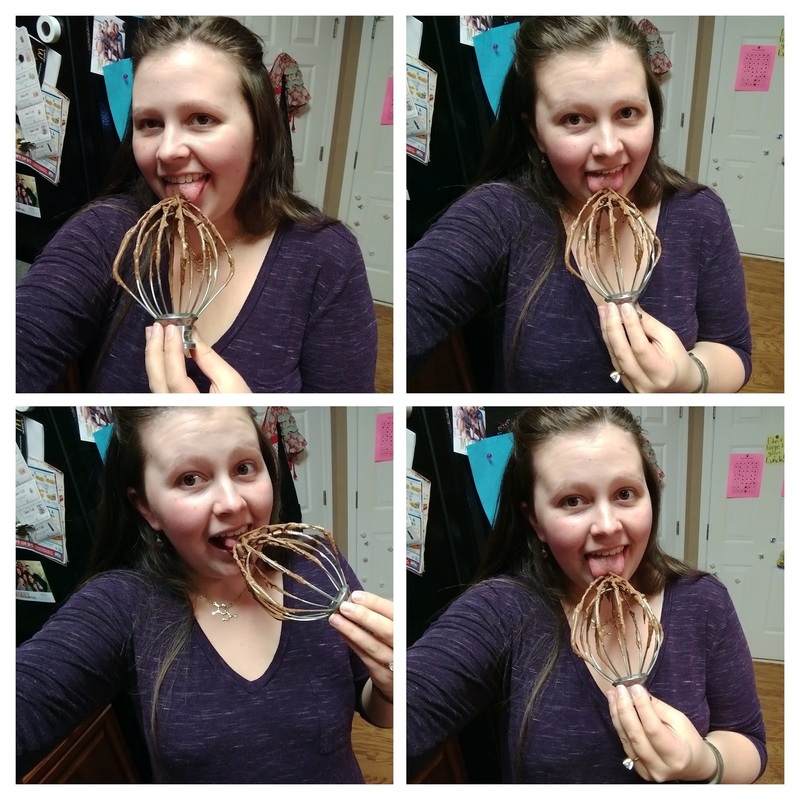 In a large mixing bowl (I use my Kitchenaid stand mixer with the whisk attachment), add all the cake batter ingredients to the bowl, except the chocolate chips, and mix thoroughly. Fold in chocolate chips with a rubber spatula. I usually fold the batter a few times with a spatula even if I didn't add chocolate chips to make sure everything was mixed completely. Sometimes at the very bottom of my bowl I find some dry cake mix. 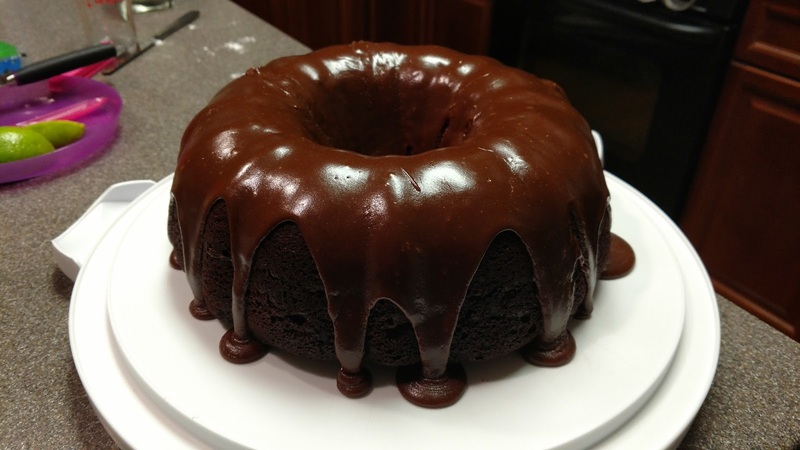 With crisco or butter, grease a bundt tin, then sprinkle it with cocoa powder. Shake the excess cocoa powder out of pan into the sink. I bang it a couple of times on side of the sink to make sure there is not too much excess cocoa. I always grease and powder my pan just as an extra precaution to make sure my cake comes out of the pan perfectly, I know some bakers who omit this step. Pour batter into the greased and powdered pan. Bake in your 350 degree oven for about 30 minutes. I use a long wooden skewer to check the cake for doneness. A toothpick works just as well. Once the cake has had a few minutes to cool turn it out onto a cake stand. After the cake has had 10-20 minutes to cool begin to make the icing. Make sure you give your cake sufficient time to cool, the icing looks best if poured on a mostly cooled cake. If the cake is too hot the icing will just melt and run down the sides. To make the Icing you need a medium sized pan, and all your ingredients measured and prepped. I do not always prep my ingredients for every recipe, but when you have something on the stove that cannot wait for you to grab the sugar out of the pantry, or the milk out of the fridge, it is very important to have your ingredients ready to go right next to your work station. Over medium low heat melt your butter, just as it begins to bubble whisk in the cocoa. When butter cocoa mixture is smooth heat till it simmers/bubbles a tiny bit, turn the heat to low. Add about half the confectioners sugar. Whisk till somewhat incorporated, then add the rest of the confectioners sugar. At this point it will clump and look awful. Don’t worry it will be ok.
Add your vanilla and a tiny bit of milk. Be careful not to add too much, put in less than one tablespoon at first. Whisk and whisk till it begins to smooth out. Occasionally the butter will begin to separate, if that happens add a bit of milk rather than powdered sugar. It seems counter intuitive but it always works for me. You want the icing to be somewhat thick not runny. If it is runny add a bit more confectioners sugar about one tablespoon at a time (also make sure it’s not too hot). This takes practice. It might take you a few tries to get the consistency just right to your liking, and for the temperature of your kitchen. Pour your icing over the cake and enjoy. It will not last long! I plan on doing a video tutorial for this icing in the near future, which I think will be very helpful. I hope you enjoy this cake as much as we do. Thanks for reading!